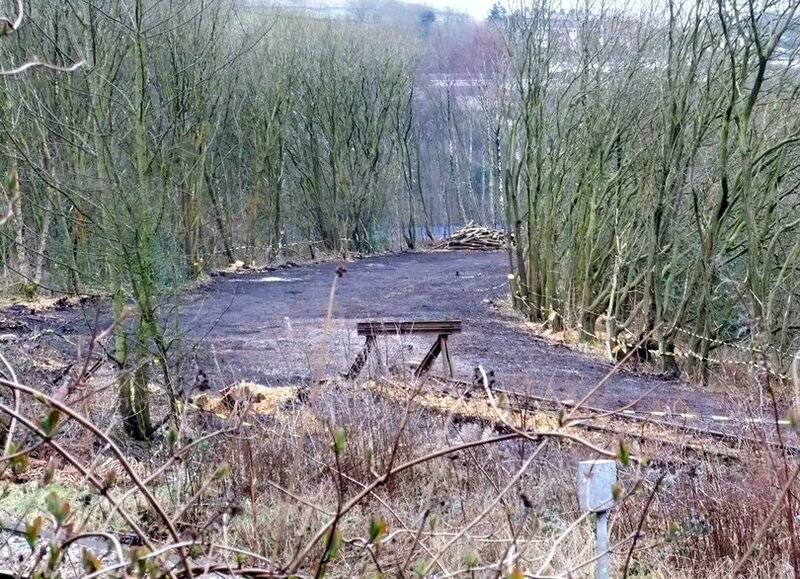 Two photographs from Andrew Stopford shows the site of short curve linking the Calder Valley line to the Copy Pit line cleared ready to be re-instated. 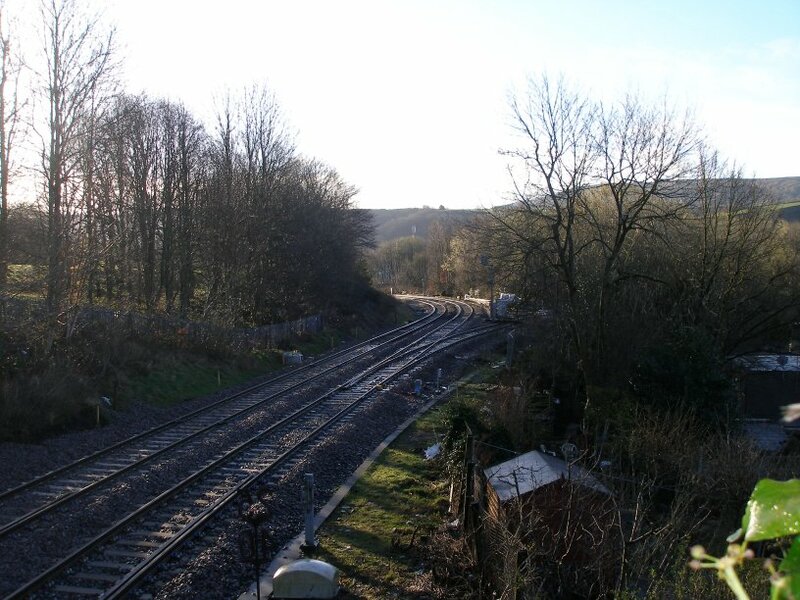 The Copy Pit line is crossing left to right in the foreground, and the viaduct leading to Todmorden Station, which carries the existing Calder Valley line, is visible centre right. 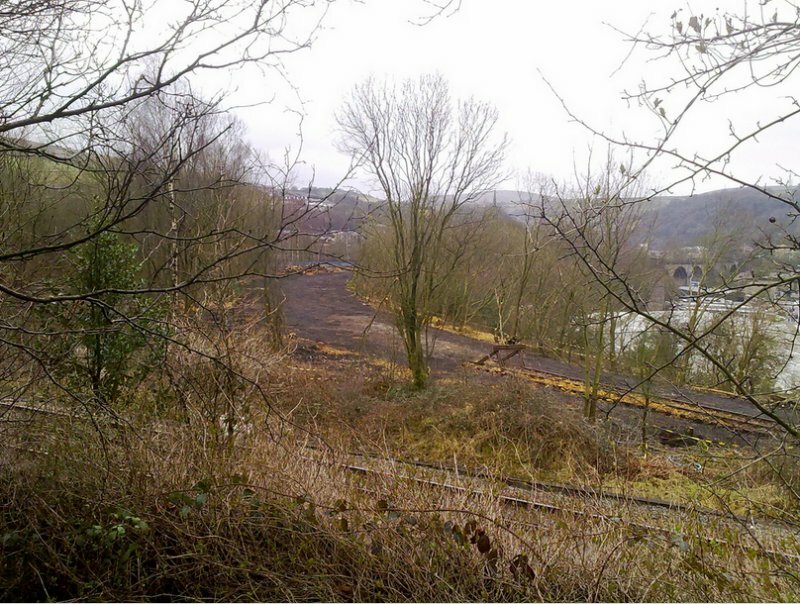 The re-instated line will follow the excavated and cleared dark coloured formation curving towards the viaduct. Simon Foster contributed a number of images taken at Stansfield Hall to show the early preparatory works. In the interests of personal safety and responsible photography, it should just be noted that the photo was taken from the right side of the boundary, with the camera on the end of a monopod held out over the fence. The photo shows class 158, number 158753 about to pass Stansfield Hall Junction. Simon has also artfully provided a composite which shows how the alignments have remained unchanged. However, Simon notes that this is to change, as the decision has now been made to realign the point at Stansfield Hall to provide a better transition onto the chord. 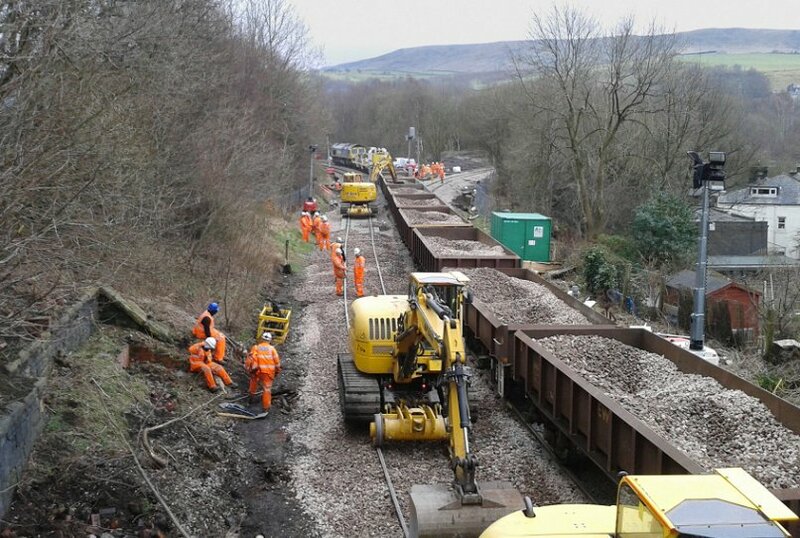 Andrew Stopford caught work finally in progress to re-instate the Todmorden Curve, which will vastly improve travel options between Rochdale, Todmorden, Burnley and beyond. 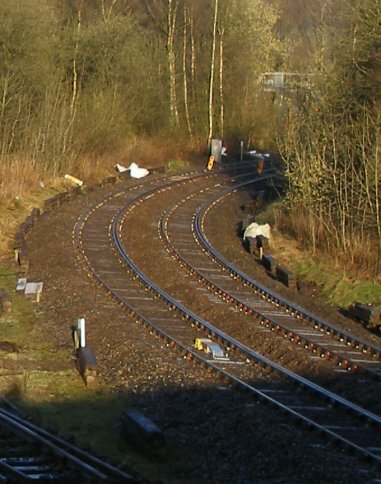 His photo shows the sleepers being laid out. Nice to see traditional wood sleepers, given that Colne has been relaid using steel and the Ffestiniog is now using plastic. 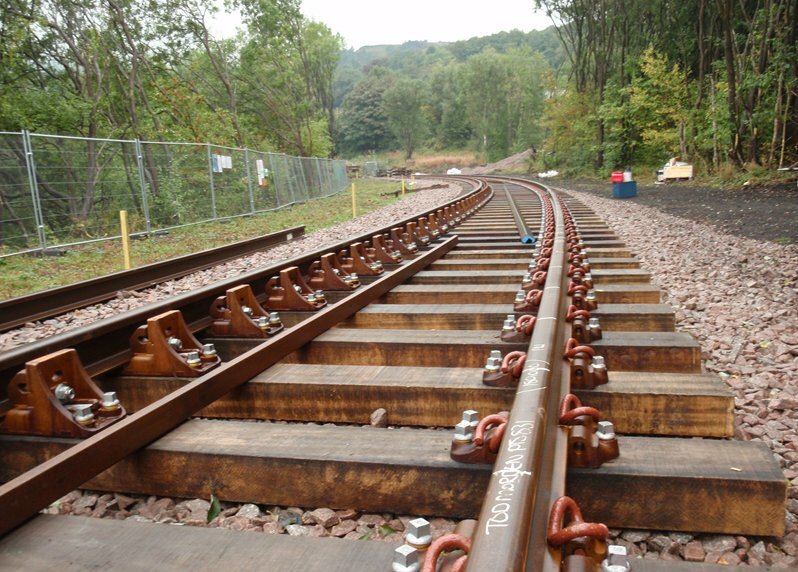 This means a certain amount of re-doing of track already laid on the chord, which was heading towards to original turnout. 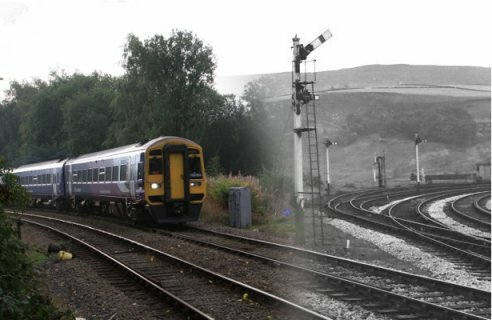 However, the plan to carry out heavy maintenance on the original would have meant a 10 mph speed restriction, and longer-term maintenance issues. So Simon's next update may not align so easily. 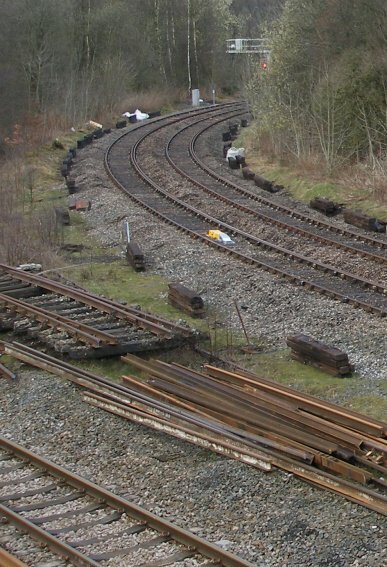 Points to note are that the track is essentially the same: still bullhead with the check rails unchanged, although the further Burnley track has been updated with flat-bottom rail immediately the check rail finishes. 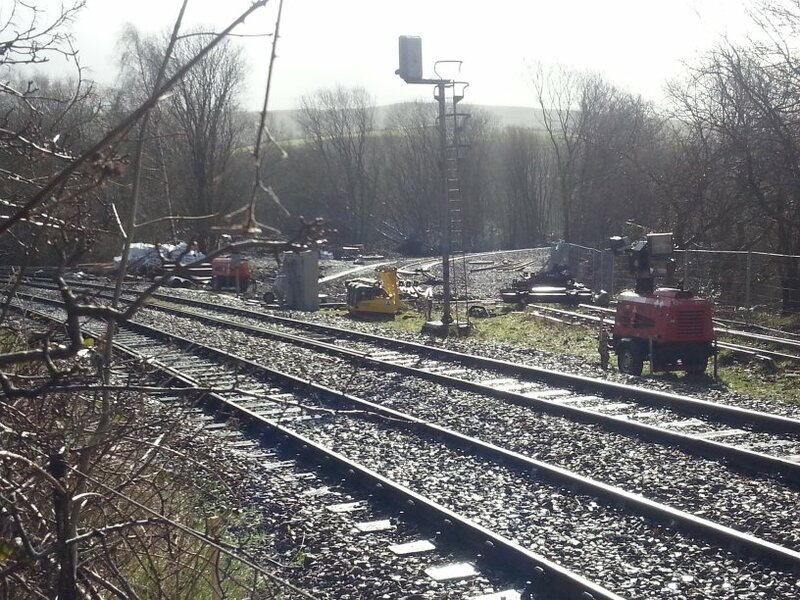 David Greenfield visited Stansfield Hall Junction on Wednesday 26 February 2014. 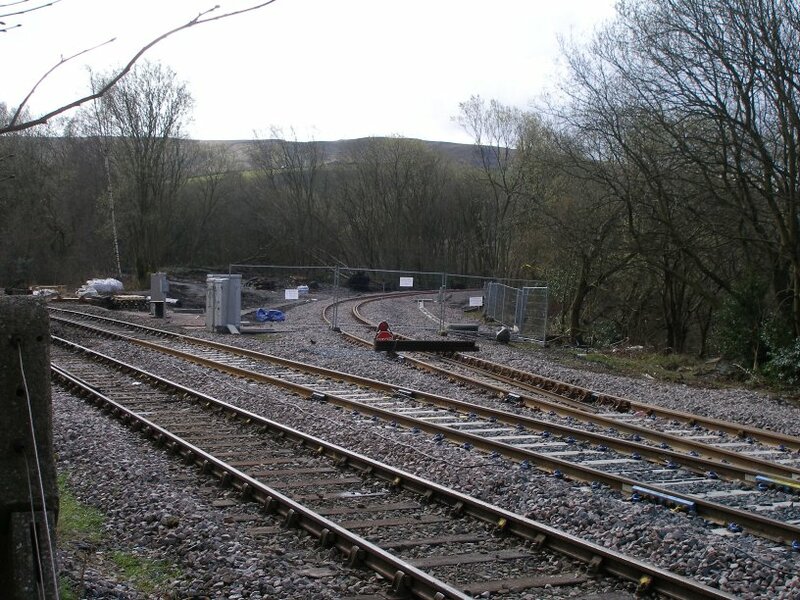 His photo shows the curve in place and ballasted, together with the remnant of the 'Engine Siding' and connection to the Burnley line. 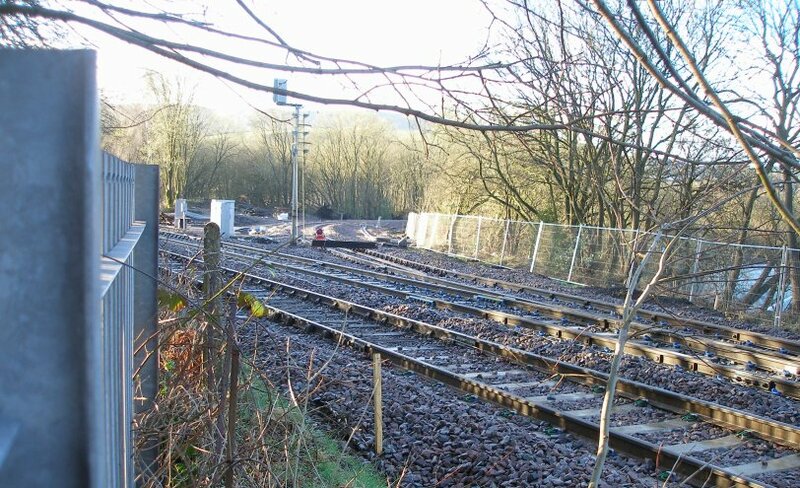 The new point is lying alongside the Burnley line, east of the junction, and just out of the photo middle left. David Greenfield noted: "The new curve is in place and looks to be a wider radius than the old curve. The old point and catch point is still in place but a new point is awaiting installation. 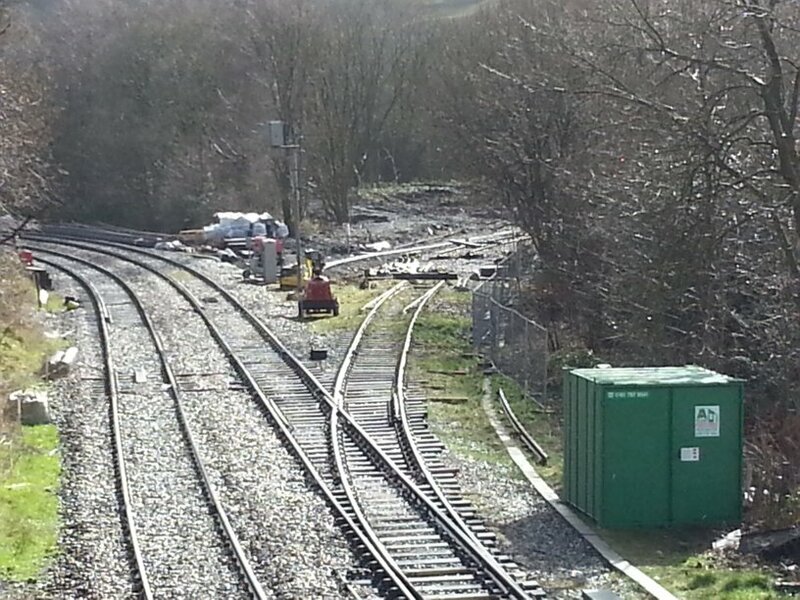 This has a large radius so the actual junction will be moved some metres towards Burnley. The old crossover is still in place but I assume that this will be replaced by a crossover at a larger radius to avoid too great a speed restriction. 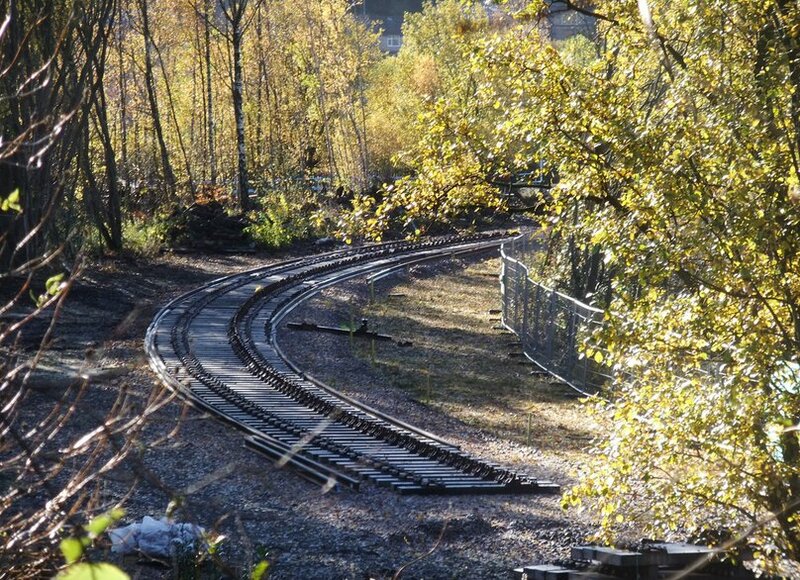 More work has been done at the other end of the curve but can’t be seen except from a passing train. No sign of signalling yet. 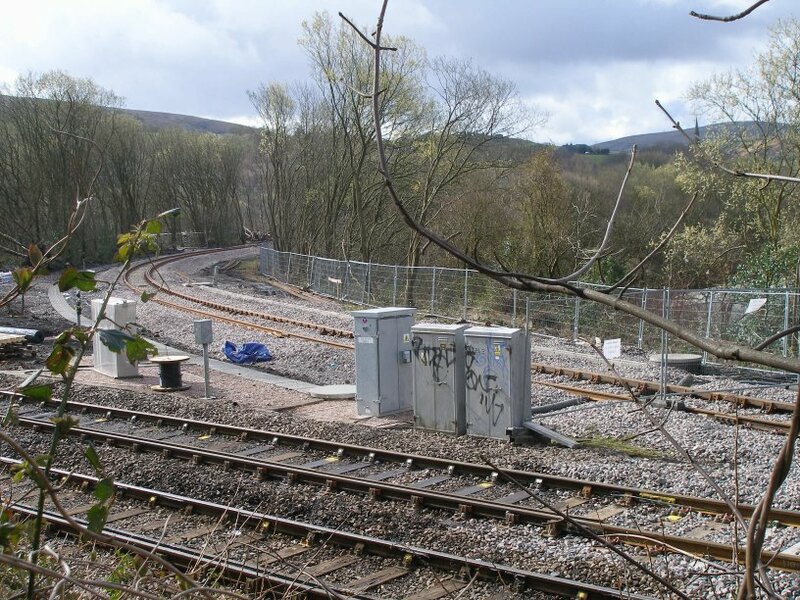 I assume trains using the curve in the Manchester direction will use a crossover to gain the down line and then access the new curve from there." Stansfield Hall Junction looking towards Todmorden East (to the right) and Hall Royd Junction (bearing to the left). The green 'box' sits very close to the site of the old LMS asbestos lamp hut. The new point can be seen in the distance, to the right of the running lines. David reports that more track panels were unloaded at Stansfield Hall at around midnight, writing: "I think they may have been the points for the crossover but haven’t seen where they have taken them too." 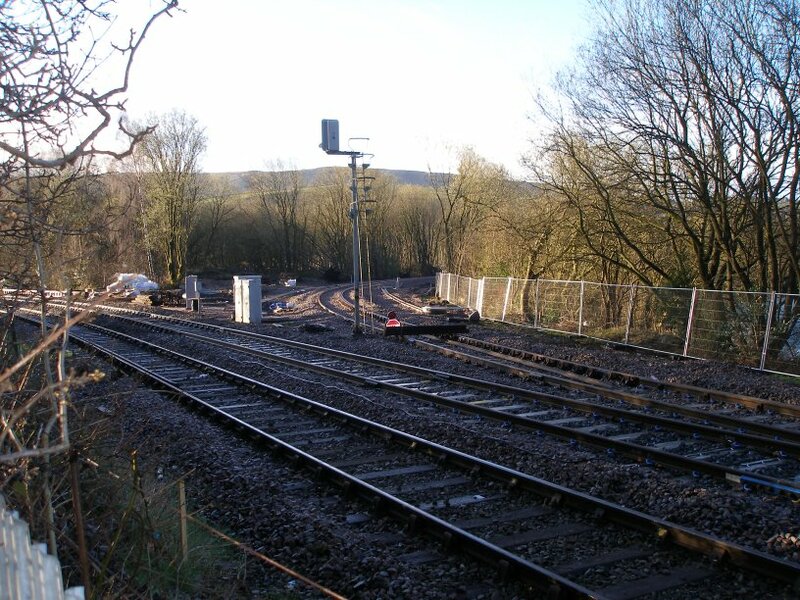 Stansfield Junction on 22 March 2014 with new crossover laid, but signal not yet relocated and so fouling new curve alignment. 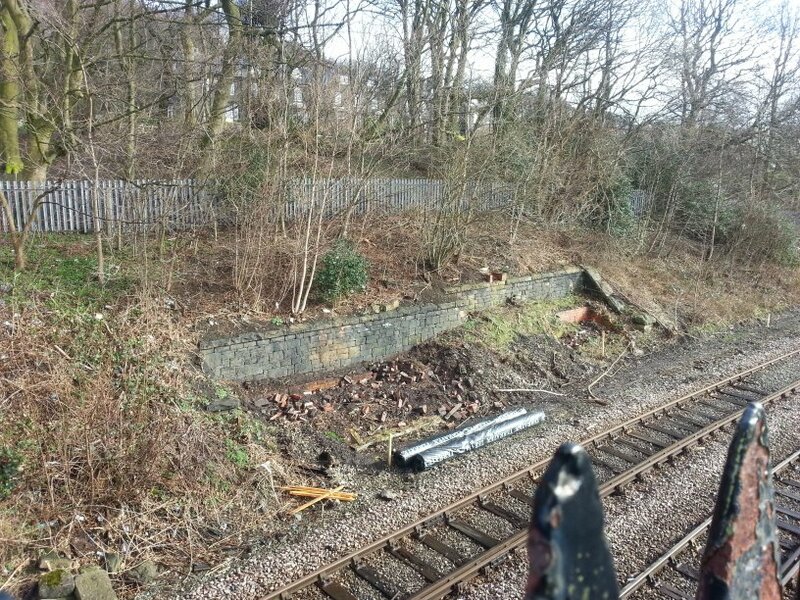 Simon Foster has also kindly contributed this shot of the remains of Stansfield Hall Junction, signal box, showing the retaining wall that ran behind the box (and on to which the stairs originally also provided access to the top of) and some of the brink work of the locking room. 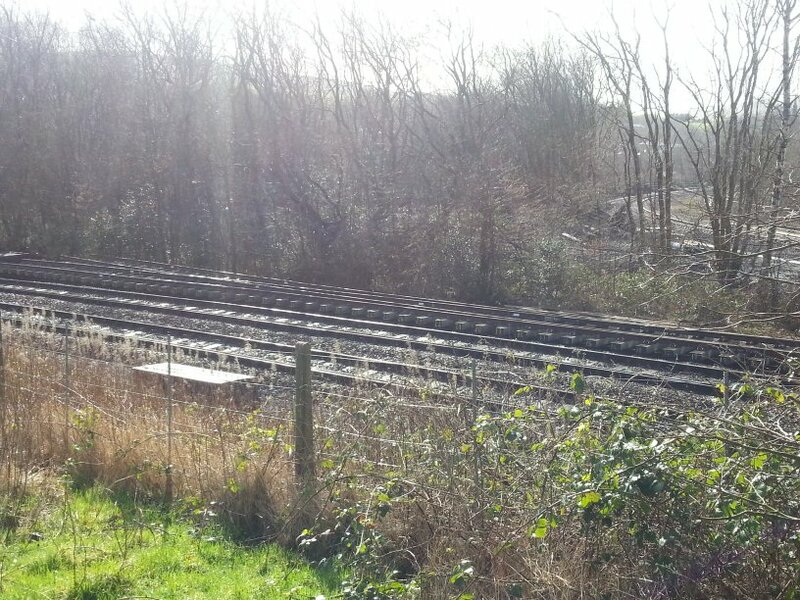 The site of Stansfield Hall Junction signal box on 26 February 2014. Fortunately the sun rose into a cloudless Pennine sky on Saturday 22 March 2014, so I had 'low sun' rather than Pennine 'no sun' conditions. As my son says, it's all about the light. By this date, the new point had been laid in, and the curve refettled to connect with it. 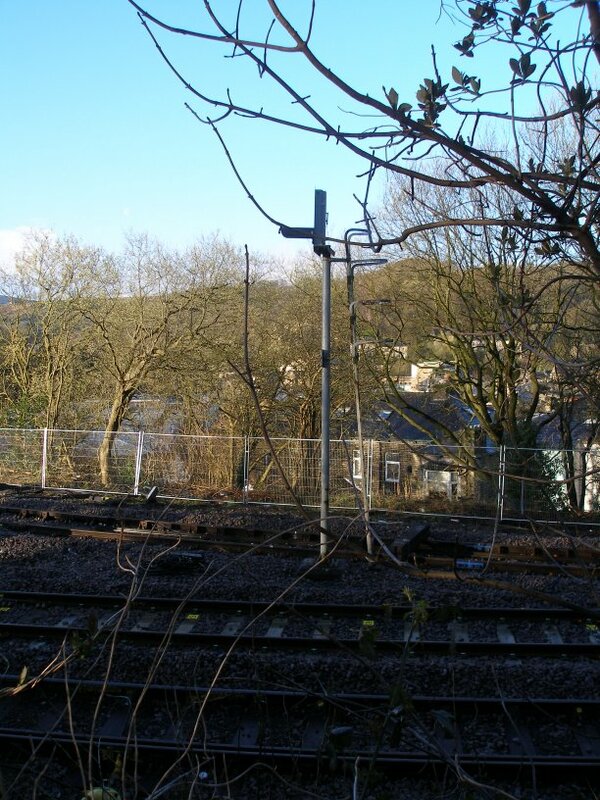 However the S&T department have still to attend as the old signal is now foul of the new curve. 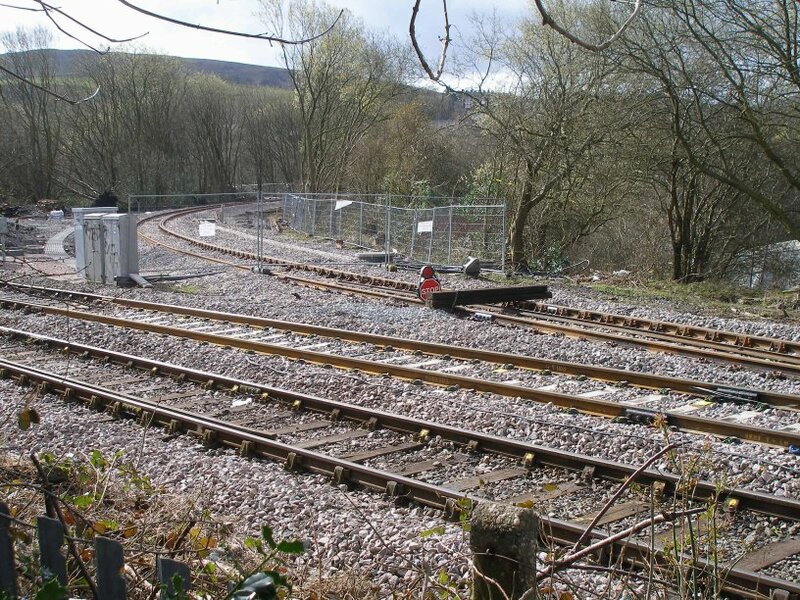 Signalling and connection of points at the Todmorden end of the curve is due to take place over the weekend of 26-27 April 2014, and the Todmorden West curve is expected to be available for traffic from Monday 12 May 2014. However, a check of the Network Rail journey planner confirms that there are, as yet, no plans to run trains over the curve. The planner currently provides times through to early June. 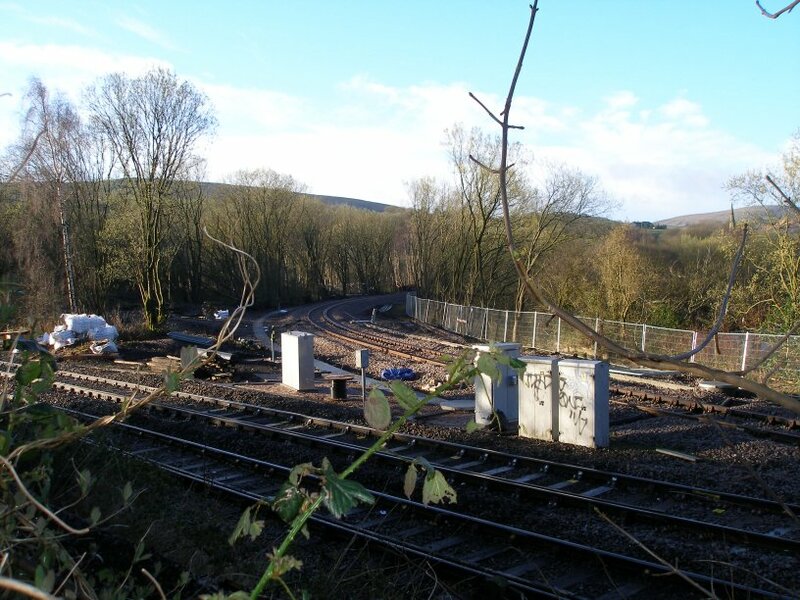 Stansfield Hall Junction Todmorden 22 March 2014. Note the sleeper acting as a stop block to the right of the signal. 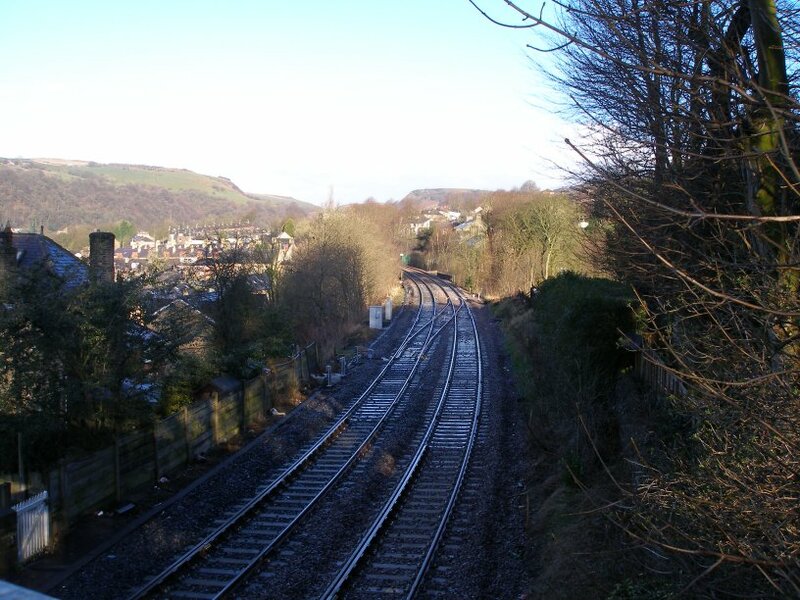 The view looking north from the footbridge. The speed restriction sign shows 40 mph for Burnley and 25 mph for the new crossover. 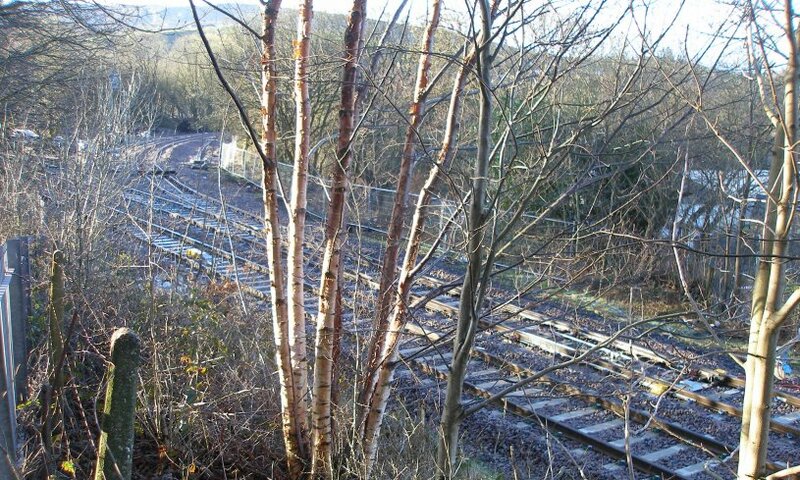 This is the site of the old Stansfield Halt. On the basis that there had obviously been changes made on Saturday or overnight, Stansfield Hall Junction was revisited. The first train carry passengers ran on Saturday 24 May 2014, and was organised by Pathfinder Tours. A pair of DRS Class 20s were provided, starting and finishing at Crewe, with a class 37 assisting with reversing moves.